On days like that, I restore my depleted energy and sorely-tested good nature with a mug of tea and something both yummy and easy to make. The tea I usually have is a heady mug of Assam, full-bodied and aromatic. 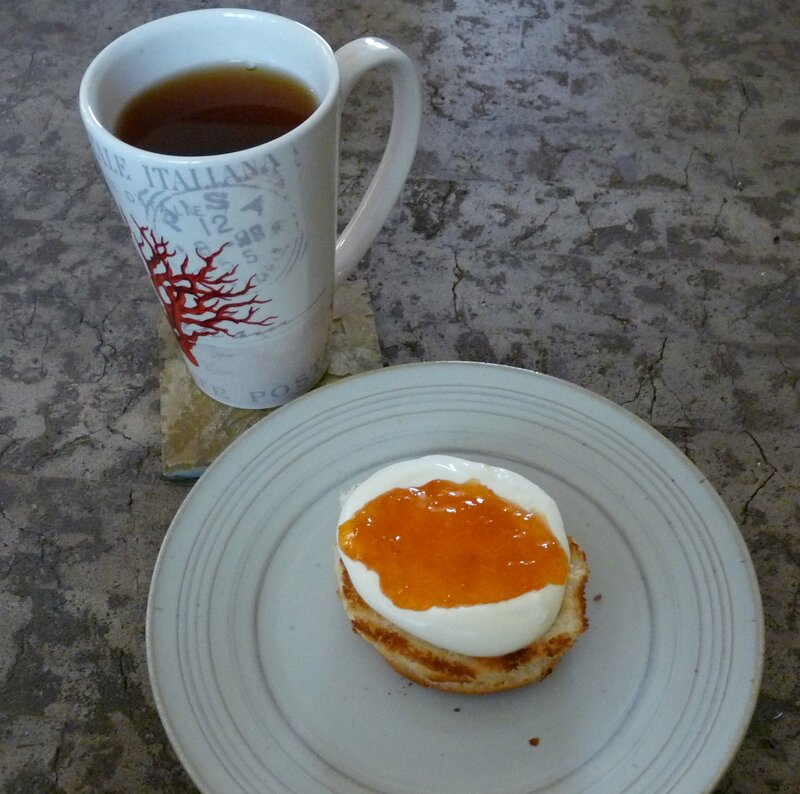 The carb-supplier is a gluten-free English muffin by a company called Kinnikinnik, toasted to a golden brown and topped with a lovely dollop of crème fraiche (I use Liberty brand) and a really good jam (in this case, Greaves’ wonderful apricot jam). We’re very lucky in Niagara to have ready access to Greaves jams, produced locally and some of the best jam outside of homemade that I’ve ever had — not too much pectin, so their jams have a nice texture for spreading, and a perfect amount of sweetness without being cloying. They’re nicely balanced by the mild tartness of the crème fraiche, and toasting the English muffin provides a slightly crunchy base along with great flavour. If you’re on a gluten-free diet, this is a great combo to have with tea, and even if you can eat wheat you may want to check out these English muffins, which are perfect for the purpose. The muffins can be found in the freezer compartments of health-food sections in grocery stores, and in health-food stores as well. I recommend putting them into the microwave first for about 15-30 seconds, depending on whether you’ve thawed them out or just pulled a frozen one from the bag; microwaving softens them up and produces a nice crumb texture when you split them with a serrated knife. You can put the whole thing together in about 10 minutes, leaving you lots of time to put your feet up and relax! Previous Stranger in a strange land?